After your programs or services have earned CARF accreditation, you will want to market and advertise your achievement to your community and stakeholders. CARF provides resources that can help you promote your accreditation, including guidelines for citing your accreditation, example news release and letter text, and several CARF seal options. This blog post explains how to properly use and display the CARF seals of accreditation in your online and printed materials. 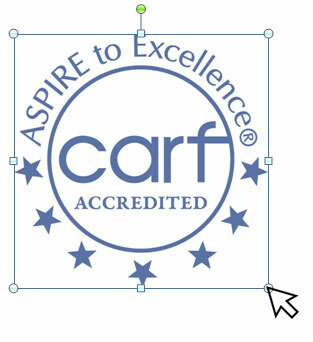 The seals of accreditation are available to download at www.carf.org/logo. CARF provides both low-resolution (low-res) and high-resolution (high-res) accreditation seals for download. The resolution of an image is measured in dots per inch (dpi), which is the number of dots in a one-inch straight line within an image. The lower the dpi of an image, the lower the resolution. Low-res refers to an image below 300 dpi, while high-res refers to an image with 300 dpi or higher. Keep in mind that, when choosing which resolution to use, bigger isn’t always better. A higher dpi makes the image file larger, so you should consider where the image will be displayed. Low-res images are usually used for materials that will be displayed on a website or computer screen. High-res images, by comparison, are usually used for materials such as printed photographs, magazines, or brochures. For reference, computer monitors usually display at 72 dpi. This means there are 72 dots in a line horizontally and 72 dots in a line vertically, for a total of 5,184 dots in one square inch. You would only need a low-res image to meet those visual requirements. If you were to use a high-res image on a webpage, it would take more time to load, because the image is such a large file, and would provide no added visual benefit. On the other hand, using a low-res image on a printed material may result in the final product being pixilated and blurry. The image on the left is a low-res CARF seal when displayed on a computer. The image on the right is the same image that was placed into a document and then printed. They are both displayed at the same size (3 inches) but in different formats. The CARF seals are available for download in four file types: JPEG, TIFF, PNG, and EPS. Depending on how you will be using the seal in your materials, one format might work better for you than another. JPEG — A format that offers both high- or low-res color versions of the seal for use in print and web materials respectively. JPEG files can be used with a wide variety of applications, including Microsoft Office® and Adobe® software. However, JPEGs must be placed on a white background. If this file is imported into a document with a colored background, it will be surrounded by a white square. TIFF — A versatile, high-res, black-and-white version of the seal that can be used for both print and web materials. The resolution is 300 dpi. TIFF files can be used in most applications, including Microsoft® PowerPoint® and Word®. This file type has a transparent background, meaning that it can be used to place the seal on a colored background. PNG — A low-res, color version of the seal that is intended for web use. The resolution is 72 dpi. It is a color image on a transparent background, meaning that it can be used to place the seal on a colored background. NOTE: GIF files were formerly provided by CARF as the low-res file option, but they have been replaced with PNG files because the image quality is better. EPS — A vector version of the seal, meaning it can be resized without losing quality of the image. EPS files are intended for use in print design applications such as Adobe® Illustrator® and Adobe® InDesign®, and will only open if your computer has such a program. EPS files will download as a compressed (zipped) file. Once you have chosen and downloaded your image file, you will want to place it in your materials in the correct manner. First, ensure that there is an adequate amount of clear space around the seal. Imagery or text placed too close to a seal makes the design feel cluttered. There should be at least the space of the letter “X” height between the seal and any other object. Nothing should be printed within or over the seal, and it should not be combined with other images or designs. Second, ensure that the seal is placed on a solid background rather than over a design or gradiation. When placing your seal, you will need to re-size it in your materials. To resize a seal while keeping its correct proportions, hold down the shift key and drag from any corner until you reach the desired size. Hold Shift key + click and drag corner to resize seal in proportion. If the CARF seal is reduced in size too much, it will become unreadable. Do not reduce it any smaller than one inch in diameter. Please visit the CARF logos page for all download options and additional guidelines for using the seals and promoting your accreditation. Any questions about the CARF seals or logos may be sent to logo@carf.org. - Ask about our CARF accreditation. - What is CARF accreditation? Please ask! - Ask what our CARF accreditation means to you. If it would help to share the ad with us for context, please email logo@carf.org and we can work with you through email.